PRESS RELEASE – Final preparations are underway for Guam’s U15 National Team headed to China, PR later this week for the EAFF U15 Boys Tournament at the National Training Center in the country’s capital. Guam U15 National Team player Caiyle Gogue looks for options on a throw-in during a recent training match against the Guam U17 National Team training squad at the Guam Football Association National Training Center in this file photo. The team will be departing to China, PR early Saturday morning to compete in the EAFF U15 Boys Tournament 2018. The team will play five matches beginning July 23. Photo courtesy of Jesse Mesa/GFA. A total of 20 players and five staff will depart early Saturday morning for the tournament, set to kick off July 23. 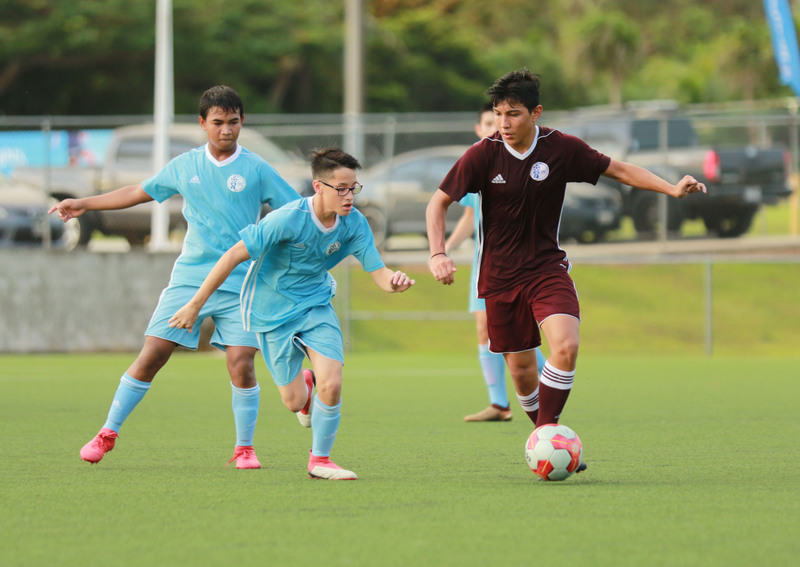 “The players, the parents, and the staff have all been dedicating a lot of hard hours to prepare for this tournament since we began training – the team is confident and ready,” said Dominic Gadia, Head Coach of the Guam U15 National Team. “This tournament is an opportunity for our young players to showcase a new type of Guam football; we are not going into this tournament solely focused on results, but rather prioritizing the performance of each individual player and how they are progressing through our long-term development plan. We have players in both the 2003 and 2004 age group and this is a fantastic opportunity to showcase all the hard work they have put into demonstrating our new national team football philosophy. “We expect the players, the staff, and the parents traveling to continue doing what we do here at home – uphold our team’s culture, values, and expectations. We are going to show professionalism on and off the pitch. This is our foundation and our football will exemplify this,” Gadia added. The final roster of 20 players features goalkeepers Alexander Stenson and Mason Bonner and field players Emilio Babauta, Tayler Bonner, Andrew Choi, Daniel Glasscock, Caiyle Gogue, Robert Haddock, Martin Iseke, Justin Joseph, Christian Kido, Morgan McKenna, Noah Mueller, Nainoa Norton, Kai Pahl, Riley Rama, Ethan Sablan, Anthony Taiga Simon, Andrew Stenson, and Nathan Toves. Seven of the players play for Wings FC, five play for the ASC Trust Islanders, and four play for the Bank of Guam Strykers. Two play for the Guam Shipyard Wolverines and one each play for Quality Distributors and NAPA Rovers FC. The staff includes Gadia, Coach Karl Dodd (Matao Head Coach), Team Manager Julius R. Campos, Team Doctor Cynthia Evans, and Athletic Trainer Hannah Hallor. The team’s first match will kick off at 4:30 p.m. Beijing time on Jul. 23 against Hong Kong. The team plays the following day against Mongolia, and then at 1:30 p.m. Beijing time Jul. 25 against Korea Republic. After a rest day, Guam plays against Macau at 4:30 p.m. Beijing time on Jul. 27, followed by its final match at 1:30 p.m. Beijing time against DPR Korea on Jul. 28. All teams in the tournament depart the following day. Guam U15 National Team player Noah Mueller looks for options as he plays out from the back during a recent training match against the Guam U17 National Team in this file photo. Photo courtesy of Jesse Mesa/GFA.